• Critter Tail One Is The World S Best Selling Hamster Home. 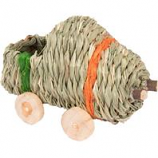 • Critter Trail One Has Six Locations Where Accessories Can Be Attached To The Home. • There Is An E-Z Access Doorway On The Critter Trail One Making Access To Your Pet Easy and Simple. • For Hamsters, Gerbils and Mice. • Kids Love Contact With Critters and The Exciting Petting Zone In The Crittertrail X Makes It Possible. • Petting Zone Can Come Off and Be A Safe Place To Keep Your Pet While Its Cage Is Being Cleaned. • Crittertrail Mini One Is The E-Z To Carry Compact Size Cage For Dwarf Hamsters Mice and Gerbils. 2 levels provide a great living space for pet rats 1/2 spaced wire and chew proof latches prevents escape. Comes complete with a comfort shelf safety ramp and food dish. Deep plastic base prevents bedding from scattering while the wire top makes for easy viewing and ventilation. Easy assembly and cleaning. .
Cage For Dwarf Hamsters and Mice, Or Add On Cage For Current Crittertrail Cages. Creates a sense of safety and security for small animals. Made from comfortable bulrush grass. . . .